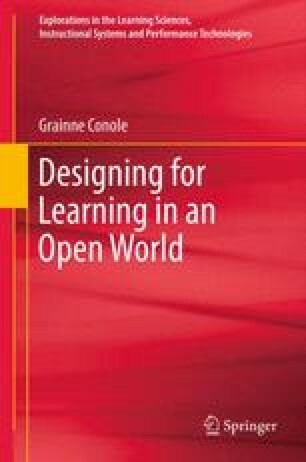 This chapter describes a number of tools that can be used for creating and visualising designs. These include specialised learning design tools as well as the use of more generic mind-mapping tools. The learning design specific tools include the CompendiumLD tool developed as part of the OU Learning Design Initiative (OULDI) work, the learning activity management system (LAMS) visual sequencing tool, the WebCollage tool for representing pedagogical patterns and CADMOS (CoursewAre Development Methodology for Open instructional System). As an illustrative example of how mind-mapping tools can be used, the tool CMap is discussed, along with the ways in which the kinds of representations described in the previous chapter can be instantiated using spreadsheets. This chapter concludes with a discussion of the benefits of such tools, along with the challenges they present. Conole, G., Falconer, I., Jeffrey, A., & Littlejohn, A. (2006). LADIE – Final project report, JJISC final report. LADIE project website and associated project outputs – see http://www.elframework.org/refmodels/ladie . Accessed 21 Sept 2011. Dimitriadis, Y. A. (2010, September 23–26). Supporting teachers in orchestrating CSCL classrooms. Proceedings of the 7th Pan-Hellenic conference with international participation: Information and communication technologies in education, Korinthos, Greece. Available online at http://korinthos.uop.gr/∼hcicte10/proceedings/K4.pdf. Accessed 11 Aug 2012. Villasclaras-Fernández, E. D., Hernández-Gonzalo, J. A., Hernández-Leo, D., Asensio-Pérez, J. I., Dimitriadis, Y. A., & Martínez-Monés, A. (2009, October). InstanceCollage: A tool for the particularization of collaborative IMS-LD scripts, Special issue on new directions in advanced learning technologies. Educational Technology and Society 12(4), 56–70. Available online at http://www.ifets.info/journals/12_4/6.pdf. Accessed 11 Aug 2011.